Nape piercings are named thus because of their location on the body. Your nape is located at the back of your neck along the cervical spine. Thinking in terms of animals, the nape is the "scruff" that mothers grab onto to carry their babies in their mouths. Humans don't have the same amount of loose skin at their napes, but it's usually enough to comfortably insert a piercing. 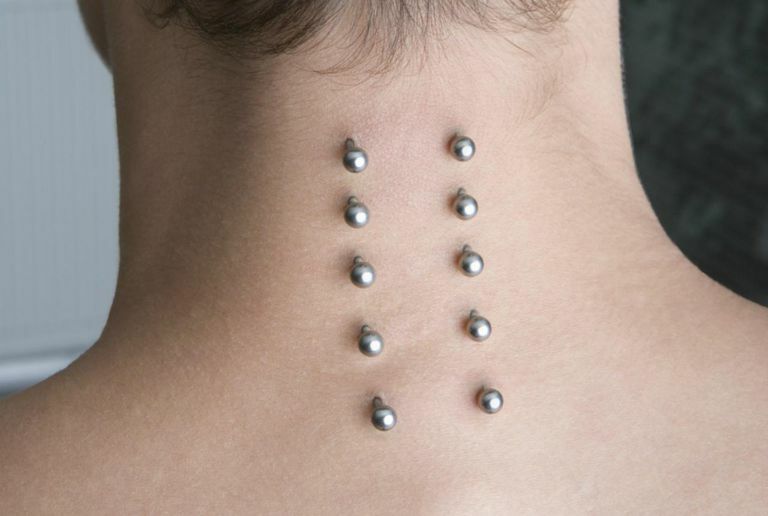 A Nape piercing is usually a straight, horizontal surface piercing; the balls on each end are the only visible part, while the connecting material is hidden underneath the skin. All surface piercing share one common risk - migration and rejection. Your body's natural defenses will sometimes fight against the piercing if it sees it as a threat. The key is to convincing your body that the piercing belongs there and doesn't pose any kind of threat. The way you do that is by making sure that it's done properly, that the correct jewelry is used, and that you follow your aftercare instructions to the letter. And sometimes, even when everything is done right, your piercing may still reject. You should be proud of such a strong and healthy immune system. Your neck is not flat, and the natural movement of the neck means that a standard piercing bar - even a surface bar - is probably not a good option for this piercing. The upper portion of the nape, just below the hairline, may be okay with a short surface bar, but the lower down you go and the longer the distance between the balls, the more movement your piercing will be subject to. In these cases, something flexible - like tygon or PTFE - would help to decrease your chances of rejection. Not many piercers work with these flexible materials, but it will be well worth your time to seek out one that does. When you've made sure to tweak the circumstances in your favor, there's a good chance you'll enjoy your piercing for many years without incident.